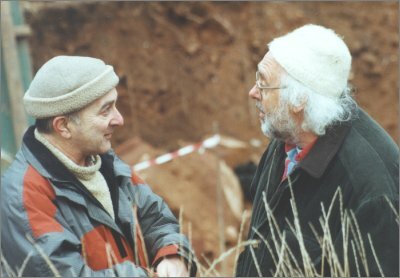 Tony Robinson and the Time Team crew have returned to Coventry to see some of the amazing new finds in the archaeological dig around Lady Godiva’s demolished cathedral. A stunningly preserved undercroft added by Benedictine monks to Lady Godiva’s priory in the 13th century has been found. Although the huge building was the only cathedral to be demolished by Henry VIII when he dissolved the monasteries, the cellars survived. As the main cathedral was demolished the rubble was thrown down the hill and into the cellars, which acted as skips. 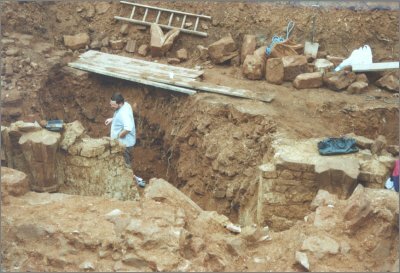 Excavation work on the area was carried out once the John F Kennedy house was demolished as part of the Phoenix Initiative. The results were so stunning that city conservation officer George Demidowicz invited Time Team back to take a second look at the site. An extra 20 minutes of footage has been shot by Tony Robinson, Mick Aston and Phil Harding to be edited into the original programme broadcast last year. It is hoped that it will be shown as an additional programme at the end of the current series. Tony Robinson, who fronts the Channel Four programme, said he was amazed at the latest findings. “I don’t think anyone dreamed that we would find archaeology so well preserved. “This is the most important cathedral site to have been dug in the last quarter of a century. The return visit follows an unprecedented first trip to Coventry, where the strict three-day rule was broken because of an exciting find. “We were here for three days but it was so exciting – we discovered a body at the end of the third day and had to stay to find out more about it. “So in total we’ve been here for seven days which is a record. We’ve only been back to one other site, the largest Roman villa ever uncovered. “One of the great bits is that there are people still building on the site. There’s new archaeology be created and the story isn’t over.